Did Hedge Funds Drop The Ball On Yum China Holdings, Inc. (YUMC) ? Is Yum China Holdings, Inc. (NYSE:YUMC) a good stock to buy right now? We at Insider Monkey like to examine what billionaires and hedge funds think of a company before doing days of research on it. Given their 2 and 20 payment structure, hedge funds have more incentives and resources than the average investor. The funds have access to expert networks and get tips from industry insiders. They also have numerous Ivy League graduates and MBAs. Like everyone else, hedge funds perform miserably at times, but their consensus picks have historically outperformed the market after risk adjustments. Hedge fund interest in Yum China Holdings, Inc. (NYSE:YUMC) shares was flat at the end of last quarter. This is usually a negative indicator. At the end of this article we will also compare YUMC to other stocks including Huntington Bancshares Incorporated (NASDAQ:HBAN), Cincinnati Financial Corporation (NASDAQ:CINF), and Synopsys, Inc. (NASDAQ:SNPS) to get a better sense of its popularity. If you’d ask most traders, hedge funds are viewed as unimportant, outdated financial tools of years past. While there are more than 8000 funds in operation at present, We look at the crème de la crème of this group, approximately 750 funds. 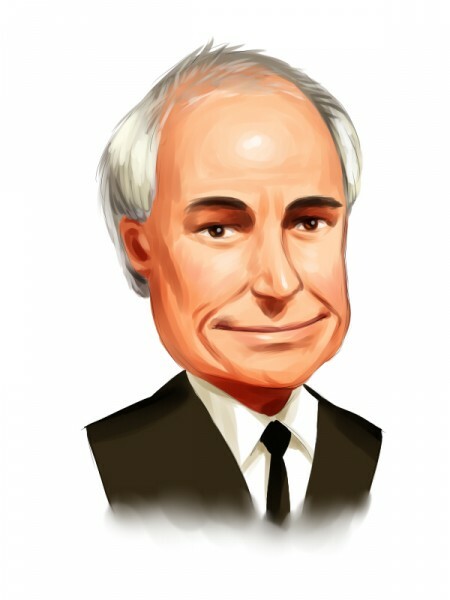 These money managers direct bulk of the hedge fund industry’s total capital, and by keeping an eye on their inimitable picks, Insider Monkey has identified a number of investment strategies that have historically outstripped the broader indices. Insider Monkey’s flagship hedge fund strategy beat the S&P 500 index by nearly 5 percentage points per year since its inception in May 2014 through early November 2018. We were able to generate large returns even by identifying short candidates. Our portfolio of short stocks lost 27.5% since February 2017 (through March 12th) even though the market was up nearly 25% during the same period. We just shared a list of 6 short targets in our latest quarterly update and they are already down an average of 6% in less than a month. Let’s take a glance at the key hedge fund action encompassing Yum China Holdings, Inc. (NYSE:YUMC). How have hedgies been trading Yum China Holdings, Inc. (NYSE:YUMC)? At the end of the fourth quarter, a total of 26 of the hedge funds tracked by Insider Monkey held long positions in this stock, a change of 0% from the second quarter of 2018. 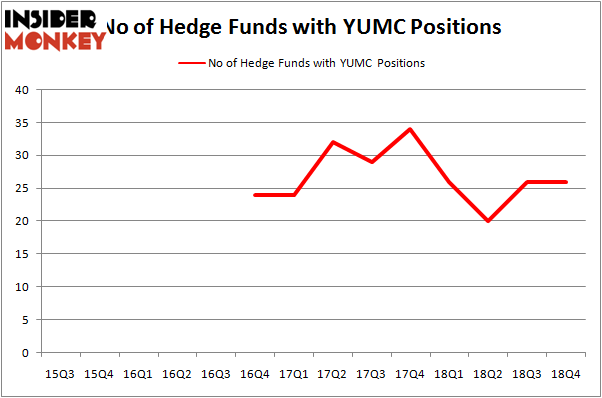 Below, you can check out the change in hedge fund sentiment towards YUMC over the last 14 quarters. With hedgies’ positions undergoing their usual ebb and flow, there exists a few key hedge fund managers who were upping their stakes considerably (or already accumulated large positions). Among these funds, Southeastern Asset Management held the most valuable stake in Yum China Holdings, Inc. (NYSE:YUMC), which was worth $176.9 million at the end of the third quarter. On the second spot was Renaissance Technologies which amassed $57.5 million worth of shares. Moreover, Millennium Management, AQR Capital Management, and Oaktree Capital Management were also bullish on Yum China Holdings, Inc. (NYSE:YUMC), allocating a large percentage of their portfolios to this stock. Judging by the fact that Yum China Holdings, Inc. (NYSE:YUMC) has witnessed declining sentiment from the entirety of the hedge funds we track, we can see that there was a specific group of fund managers that slashed their full holdings last quarter. At the top of the heap, David Harding’s Winton Capital Management dumped the biggest position of the 700 funds tracked by Insider Monkey, comprising an estimated $16.1 million in stock. Run Ye, Junji Takegami and Hoyon Hwang’s fund, Tiger Pacific Capital, also said goodbye to its stock, about $15.8 million worth. These bearish behaviors are intriguing to say the least, as aggregate hedge fund interest stayed the same (this is a bearish signal in our experience). Let’s now review hedge fund activity in other stocks similar to Yum China Holdings, Inc. (NYSE:YUMC). We will take a look at Huntington Bancshares Incorporated (NASDAQ:HBAN), Cincinnati Financial Corporation (NASDAQ:CINF), Synopsys, Inc. (NASDAQ:SNPS), and Tenaris S.A. (NYSE:TS). All of these stocks’ market caps resemble YUMC’s market cap. As you can see these stocks had an average of 24.25 hedge funds with bullish positions and the average amount invested in these stocks was $525 million. That figure was $478 million in YUMC’s case. Synopsys, Inc. (NASDAQ:SNPS) is the most popular stock in this table. On the other hand Tenaris S.A. (NYSE:TS) is the least popular one with only 13 bullish hedge fund positions. Yum China Holdings, Inc. (NYSE:YUMC) is not the most popular stock in this group but hedge fund interest is still above average. This is a slightly positive signal but we’d rather spend our time researching stocks that hedge funds are piling on. Our calculations showed that top 15 most popular stocks among hedge funds returned 19.7% through March 15th and outperformed the S&P 500 ETF (SPY) by 6.6 percentage points. A handful of hedge funds were also right about betting on YUMC as the stock returned 27.7% and outperformed the market as well.